Everyone loves a grand exit. The getaway car used by a couple after their wedding can say a lot about the couple’s personality and style. It can add to a wedding’s theme or the anticipated vibe, and it can be a fun decision for the bride and groom to make together. While a limousine is a traditional option, there are plenty of other unique options to consider. Nothing says sophistication quite like an old, classic car. Some great antique cars to think about include a Ford Model A or Model T, 1920s Buick Roadster, or a Hudson Super 6. There are many convertible or classic options, but it depends entirely on what strikes your fancy. A convertible is not a good choice if the bride is attached to her hairstyle and maintaining its wedding perfection. If you’re getting married near a body of water, a boat is a great option to consider. It may sound cliché, but sailing off into the sunset together as a newly married couple in a sailboat is almost as romantic as it gets. Speed boats and rowboats are also worth thinking about, depending on where your wedding takes place and where you’ll be heading afterward. While it may not be the first getaway vehicle that comes to mind, a trolley is a charming and elegant option that reminds everyone of a simpler time. They have a festive and almost whimsical feel and look great in photographs. Getting in and out of cars can be difficult in a large wedding gown, but a trolley allows passengers to step aboard with ease. Ride away in style while being green and reducing your carbon footprint if even just a bit. It can be cute to have matching bikes or to ride a tandem bicycle together. Pedaling with a full gown is a difficult task, even for the most experienced of riders. So changing into a shorter skirt or special riding outfit might be ideal. But if you want to keep the dress on, maybe hiring a rickshaw is worth considering instead. Let your glamorous side-show a bit with a luxury car getaway. Several options to choose from include the Rolls Royce Phantom or Silver Cloud, Maybach 62, or a Bentley. Daddy’s little girl will love being whisked away in such a classy ride. Sometimes there’s no rival for that small, hometown feel. Complete your country wedding with a tractor getaway. If you’d like, you can add a hay wagon to the back or simply drive away together in the tractor. Some couples just aren’t suited for a fancy car or a bicycle ride; some have an intense need for speed and style. While it may not be the classiest or most ‘green’ getaway vehicle, a motorcycle getaway is sure to make a bold statement. Or you can opt for a Vespa scooter that matches your wedding colors. Make an incredibly grand gesture and amaze wedding guests with a helicopter getaway. A helicopter allows you to take a moment to get away as a couple and enjoy the aerial view of everything below. Share a few moments and a champagne toast together as a newly married couple. Rustic weddings are all the rage, and what better way to complete the package than with an old pickup truck getaway? A truck that has been maintained or restored provides a refined and vintage taste while showing guests that the couple likes to keep things low-key. 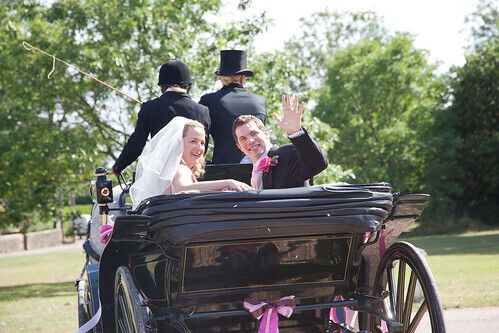 Complete your fairytale wedding with a horse-drawn carriage. If you get married in the snow, go for a horse-drawn sled instead. Or you can ditch the vehicle portion of the getaway and ride away together on horseback. Whatever getaway car suits your style, avoid making it look trashy. Tell the best man and maid of honor to stay away from toilet paper if they decide to decorate. They should also avoid silly string, shoe polish, and shave cream, as they can damage the paint. There are many companies that offer wedding getaway vehicle rentals, but it may also be good to ask around as friends or family members may have connections. Embrace the mode of transportation you fancy and start your married life in a truly unforgettable way. The Low fat Fryer that changed Oprah Winfrey’s life!